The Baby Friendly Program is made up of a group of Thayer County Health Services hospital employees who are dedicated to improving the care and birth experience for our expecting moms, newborns, and their families. The current members include Dr. Leann Heinrichs, Ranae Vorderstrasse, RN, Kim Francis, RN, Miranda Tipton, RN, and Haley Wiedel, LPN. The Baby Friendly Program was started at Thayer County Health Services in the fall of 2015. A need was recognized after a couple of TCHS staff attended the Nebraska Perinatal Quality Improvement Collaborative (NPQIC) Fall Summit in Lincoln, NE. A few concerns that registered with these participants included Nebraska’s 48th ranking in the nation in regards to exclusive breastfeeding and also the high cesarean section rates across the country. With these concerns in mind, the Baby Friendly Program was created to help address these needs while also focusing on prenatal education, breastfeeding support, and improving the best practices for labor and delivery. TCHS’ Baby Friendly Program is fortunate enough to be comprised of employees from different areas of the facility to best serve the patients in the surrounding communities. There are nurses from the clinic, hospital, and triage departments, individuals who teach the prenatal classes, and others that have a passion for helping new moms and babies. Having members throughout the hospital allows them to address patient concerns and to recognize areas needing improvement in many diverse settings. The dedication these members put into the program seems to be working as they were recently awarded two different grants and three scholarships. The Baby Friendly Program was the recipient of one of the Norris Public Power “Operation Round-Up” grants to use towards the purchase of a hospital grade Medela breast pump for both employee and patient use at the facility. They were also granted $500 through the Nebraska Breastfeeding Coalition to form an alliance for breast feeding support in the community. The scholarships that were awarded were used to send three of Thayer County Health Services’ nurses, Haley Wiedel, Miranda Tipton, and Natalie Marsh, to a five day course in York, NE, where they received specialized training to become Certified Breastfeeding Counselors. They, along with Dr. Heinrichs, who is a Certified Lactation Specialist, are able to offer breastfeeding expertise. 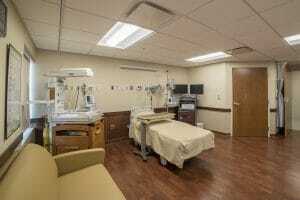 In addition to the new items to help improve the overall experience provided by the Baby Friendly Program, patients can now enjoy and utilize TCHS’ two new Labor, Delivery, Recovery, and Postpartum (LDRP) rooms.